For the first time in history, half of the worlds population is living in mega-cities. Never before have we confronted such a geography of the worlds people. Analysing cities through spatial understanding, City Worlds explores how different worlds within the city are brought into close proximity. The authors outline new ways to address the ambiguities of cities: their promise and potential, their problems and threats. Doreen Massey id Professor of Geography at The Open University. Her recent books include Spatial Divisions of Labour (2nd Edition), and Space, Place and Gender (1994). She is co-founder and joint editor of Soundings: a journal of politics and culture. John Allen is Senior Lecturer in Economic Geography at The Open University. His recent publications include A Shrinking World? 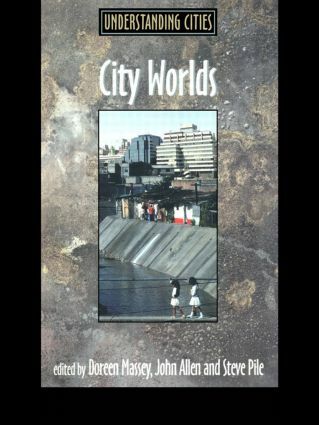 (1995, co-edited with Chris Hamnett) and Rethinking the Region (1998, with Doreen Massey and Allan Cochrane). Steve Pile is Lecturer in the Faculty of Social Sciences at The Open University. His recent books include The Body and the City (1996), Geographies of Resistance (1997, co-edited with Michael Keith) and Places Through the Body (1998, co-edited with Heidi J. Nast).